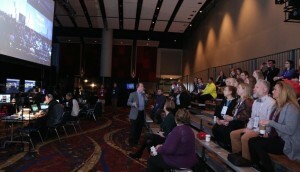 PCMA Convening Leaders 2015 in Chicago showcased cutting-edge location-based technology through its mobile app for the 4,128 attendees at the annual meeting. From QuickMobile, the app used geofences and Bluetooth iBeacons to send messages and alerts, share content and capture data, all to improve the attendee experience. High levels of security on the front-end (encryption) and the back-end (content management) should allay customer concerns about any potential for security or data breaches, said QuickMobile CEO Craig Brennan. Facilities are also diving into location-based technology. A week after the PCMA meeting, the Massachusetts Convention Center Authority announced it will deploy 270 transmitters using Sherpa Solutions’ proprietary system throughout the Boston Convention & Exhibition Center to enable digital wayfinding for attendees. This should be completed in March 2015, complementing a wireless infrastructure overhaul at the center. Sherpa (which showed its technology at PCMA’s TechCentral area) has supplied location-based capabilities for Reed Exhibitions trade shows. • Rather than an ancillary space, this year’s Learning Lounge (a collaboration with Freeman) was integrated into both the environment and educational program. It featured a variety of setups, from small stages to even smaller meeting spaces for short bursts of education, guided conversations and self-learning on highly focused topics. These areas were often filled to overflowing. Although scheduling was staggered for these sessions, sound did bleed from one area into another, which PCMA will address in planning 2016’s meeting in Vancouver. • The hybrid “mashup” studio-and-session space was positioned at one end of the Learning Lounge (which ran along one side of McCormick Place’s West Building concourse). In a small footprint, this space featured a single camera on a raised stand in the center that did double-duty: recorded education on one side, then the camera flipped to the other side for one-on-one interviews. • Production partner Freeman set up monitors and a “bleachers” area (photo at left) behind the general session stage for 30 meeting planners on Day 1 and 30 students on Day 2 to follow “behind the screens” action by some two dozen technicians. “Everything at this meeting should be a ‘teachable’ moment,” said Kelly Peacy, CAE, CMP, senior vice president, education and meetings, PCMA. • To break up general sessions, occasional “conversations” were conducted on either of two “satellite stages” set halfway back from the stage and on the outer edges of floor seating.